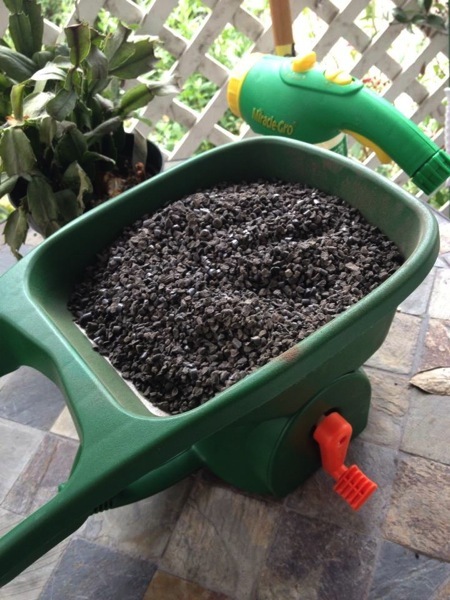 So I have already whined about the difficulty of organic gardening (Don’t yell at me; I still do it), and so one of the its practices involves the spreading around of what I can only refer to as magic pebbles. Why? Because I have no idea what I am doing or why. John and Bob’s soil amendments are supposed to help your soil: the PENETRATE, NOURISH, OPTIMIZE, MAXIMIZE routine. I have no idea whether they do or not. They have very scientifical sounding rationales for the magic pebbles (which is the OPTIMIZE product). Here is either John or Bob explaining OPTIMIZE. He might as well be speaking Klingon, I have no idea what is going on. But I spread my magic pebbles around the garden like good girl. When does the magic happen? Anybody know?